This season guard James Harden has become a very effective scoring threat for the Houston Rockets as he’s taken his scoring to unprecedented levels. He’s currently averaging 34.8 points per game and he’s put up 30-plus points in 17 games in a row, breaking Kobe Bryant’s record of 16 straight games with 30 or more points. He’s had some amazing games this season, including a recent 57-point game against the Memphis Grizzlies. Harden’s scoring prowess couldn’t come at a better time for the Rockets as they’ve been missing Chris Paul since late December with a hamstring strain and recently found out that Clint Capela will be out for four to six weeks after surgery in his right thumb. Despite the injuries and early season struggles the Rockets now look primed for another postseason run and that is mostly because Harden has put the team on his back, leading them to a 7-3 record over the last 10 games. Harden is controlling the offense for the Rockets and is scoring at will from almost anywhere he decides to shoot. Overall what Harden has been doing is both historic and unprecedented as he’s currently playing at levels we’ve never seen before in his career. Although his playing style may draw criticism and at times can be hard to watch, it’s effective and more importantly is helping him lead his team to wins. 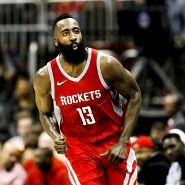 With so many injured teammates Harden is likely to continue shouldering most of the load so it would not be surprising to see him putting up more games of 40-plus points. Although he can be quite a controversial player as he often draws questionable fouls and averages 11.1 free throws per game it’s undeniable that he’s developed into one of the most prolific scorers in the NBA. At some point though the Rockets staff may want to put the brakes on Harden and give him some games off because at the current pace he risks getting injured or being burnt out before the start of the postseason.